Optec acquired Alnitak Astrosystems in 2011 and has been manufacturing and refining the Alnitak EL lamp and controller ever since. With the introduction of the Flip-Mask and Remote Dust Cover, we're proud to continue the Alnitak tradition of offering astrophotographers and photometrists the finest in flat-field calibration systems along with new and innovative remote devices not currently found in the astronomy marketplace. Featuring a USB connection, our Alnitak Astrosystems Control application automatically recognizes any attached device and allows 256 levels of brightness adjustment. For those seeking to automate their flat-field acquisition process, the Alnitak software package also include a serial command-line interface allowing full integration into the latest versions of astronomy automation programs such as ACP, CCD Autopilot, and Maxim DL. 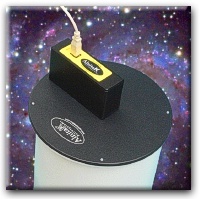 Alnitak Astrosystems' flagship product is the Flip-Flat, designed as a combination dust cover and flat field calibration lamp. 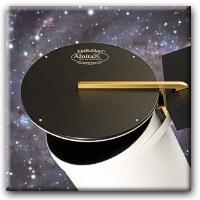 Utilizing a remotely controlled motorized arm and electroluminescent lamp, the Flip-Flat provides convenience and precision calibrations for refractors up to 6-inch (155mm) diameter OTA's. "I have one of your Flip-Flats that I use with my AP 130GT. I love it." 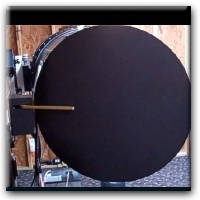 See Charlie Warren’s review of the Flip-Flat in the Fall '09 issue of Amateur Astronomy magazine. Click here for more information on the Flip-Flat. Building upon the success of the Flip-Flat, the Flip-Mask provides robotic control of a Bahtinov Mask focusing aide for remote telescope installations. 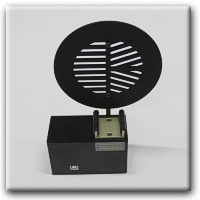 Available with Bahtinov Masks up to 12-inch diameter the Flip-Mask can be configured for most amateur sized Optical Tube Assemblies. Bahtinov Masks display a unique diffraction pattern that provides irrifutably proof that the very best focus within the Critical Focus Zone has been achieved. Click here to learn more about the Flip-Mask. For those on a budget who don’t need the robotic features of the Flip-Flat, the Flat-Man is an excellent choice. Employing the same EL lamp technology as in the Flip-Flat and powered by a single USB cable, the Flat-Man is simple to use. The Flat-Man is manually placed on the vertically oriented OTA and the lamp brightness levels can be controlled via the attached PC. OTA's up to 6-inch (155mm) are supported with the Flat-Man. For larger scopes, the Flat-Man L is available for manual or remote flat field calibrations. Click here for more information or to order the Alnitak Flat-Man. For owners of medium size telescopes with OTA's in the 8-13" range, the Flat-Man L will fit your needs. It can either be placed on the vertical OTA, or hung on an observatory wall perpendicular to the parked telescope OTA to obtain great flats. As with all Alnitak flat fielding devices, the brightness can be controlled via our custom Windows controller, or with a command line program that can be used in scripts. The Flat-Man L requires an external power supply (included in the package) in addition to the USB communications cable, but is easily used with any OTA up to 12-1/2 inches. Click here for more information or to order the Alnitak Flat-Man L.
The Flat-Man XL is our research-grade, observatory-class flat-field calibration panel for the most demanding applications. The larger Flat-Man XL40 has been in use for several years by Adam Block at the Mt. Lemmon SkyCenter. 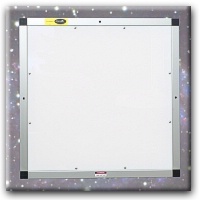 Hundreds of our XL panels have been mounted in amateur and professional oservatories alike. With sizes ranging from 18" x 18" to 47" x 47", Optec manufactures an XL Flat-Fielding lamp system to suite nearly any observatory and OTA size. "We use our Flat-Man XL’s whenever we’re taking pictures or doing research. They work great and we’re thrilled with them! No observatory should be without them! Excellent quality, reasonable price, the best flat-fielding we’ve ever done! Thanks for a superb product!" Only 1" deep, the Flat-Man XL lamp panel mounts directly to the observatory wall perpendicular to the telescope park position. The Alnitak Astrosystems command-line program is fully integrated into ACP, CCD Autopilot, Maxim D/L using scriptable command line interface for automated operations. 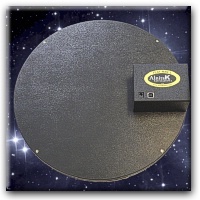 Following the suggestions of several satisfied Alnitak Astrosystems customers, Optec has modified the Flip-Flat motor controller to allow a light-weight Remote Dust Cover to be installed on telescope OTA's up to 24-inch diameter. Using a unique lightweight corrugated poly-propylene material, we can fabricate Remote Dust Covers for unattended operation in nearly any size required. For best fit, measure the outside diameter of your OTA (optical tube assembly) and add 1-inch. Click here to learn more or to place your order today. Sky & Telescope has recently made Pete Kalajian's article, "Demystifiying Flat Fields" available in PDF format. "Flip Flat - Imager's Best Friend"
Reprinted from Amateur Astronomy magazine. "Flip-Flat" review by Alan Smallbone reprinted from the June/July 2009 edition of AstroPhoto Insight Magazine. Full PDF copy is available for download here.